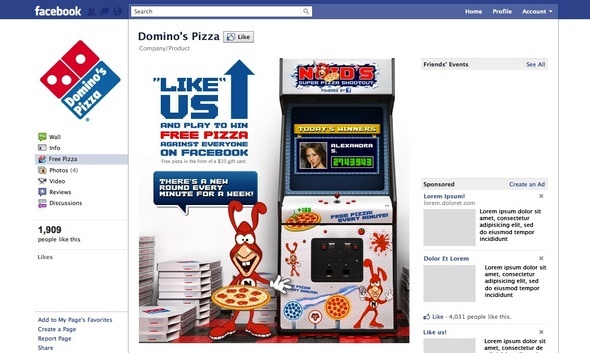 Posted on Mon, Aug 8, 2011 : 11:37 a.m.
Domino's Pizza created a Facebook game to feature the NOID, a long-eared red cartoon character featured in the company's advertising in the 1980s. A polarizing, long-eared red mascot that Domino's Pizza used in its marketing in the 1980s is back. The Ann Arbor Township-based pizza chain said today that it would feature the NOID in a one-week promotion through its Facebook page. The mascot was "a cartoon character of indeterminate species, never really talking but always laughing wickedly as he sent thunderstorms to bedevil Domino’s pizza deliverers or bounced around on a pogo stick to try to flatten a cheese pie," the Associated Press reported. Domino's said in a statement that the promotion, called "Avoid the NOID," would give fans a chance to play an 8-bit-style Facebook game for a chance to win a gift card. The NOID, it turns out, was created in 1986 — making 2011 its 25th anniversary. "Or is it his?" Domino's asks, coyly, in its press release. It's the latest in a series of nontraditional marketing campaigns for Domino's, which has had huge success with commercials acknowledging that its previous pizza wasn't good enough, prompting a total redesign. For a history lesson, watch this commercial from 1988 in which the NOID tries to destroy a Domino's pizza with liquid nitrogen. Tue, Aug 9, 2011 : 3:03 p.m.
Hey I have an idea... LIGHTEN UP, DEBBIE DOWNERS! You're hating on a cartoon character... lol A lot of folks prefer news to be balanced out by occasional entertaining and/or silly happenings... if you want to be macabre and dismal, look for different headlines and comment on those. It's pretty simple... YOU ARE IN CONTROL OF WHAT YOU READ. Wed, Aug 10, 2011 : 8 p.m.
Tue, Aug 9, 2011 : 3:39 p.m.
Um it seems reasonable to complain about something so insignificant as..&quot;the noid&quot;.. being foisted upon us as news. And when it is on the front of the web page then someone else is controlling what we read. Tue, Aug 9, 2011 : 2:03 p.m.
Tue, Aug 9, 2011 : 6:50 a.m.
Best memory of my mom, hands down, is when she agreed to dress up as the Noid and pass out coupons at our local heritage festival. I had to accompany her because she couldn't actually hand out anything, in fact all communication was completely out the window with that getup. As I passed out coupons, my mom had to suffer through countless kids knocking on the costume's head. I was maybe 12 at the time. Best mom memory ever for sure. Tue, Aug 9, 2011 : 3:34 a.m.
Not only is this an advertisement, the poll is a marketing-research tool for Domino's. I wonder how much Domino's paid aa.com to compromise their journalistic principles. Oh, wait. They threw those away years ago. Never mind. Tue, Aug 9, 2011 : 9:44 p.m.
Tee hee... Sorry, couldn't entirely contain myself. Carry on (you are correct). Tue, Aug 9, 2011 : 2:45 a.m.
Tue, Aug 9, 2011 : 1:45 a.m.
For heavens sakes this is a joke! The noid? yessir the noid right up there with Speedy Alkaseltzer and Mr Clean.....it was a dumb campaign back then and hardly worth mentioning now and certainly not news. Mon, Aug 8, 2011 : 10:35 p.m. In the decadent '80s I was living in Greensboro NC and I had a &quot;friend&quot; who dressed as the Noid for Halloween. He evidently attended a rather wild party celebrating the evening and had a bit too much of whatever. He awoke the next morning in the bushes of the public library to one of Greensboro's finest saying &quot;wake-up NOID!&quot; The costume must have been stellar! Mon, Aug 8, 2011 : 9:08 p.m.
Hey, the Noid was much better than Burger King's &quot;Where's Herb&quot; promotion from the same era. Mon, Aug 8, 2011 : 8:37 p.m. Thank you from the bottom of our Noids heart. We ended up carrying one of these giant things home from Cedar Point one year. Ended up becoming our child's favorite toy. We also have their Noid toys as well. Thanks for the memories. That was a blast from the past. Mon, Aug 8, 2011 : 7:46 p.m. Thanks Nathan for this important business news. I would have been totally misinformed if I hadn't read this. How about a story about SPARK and the latest installment of millions in taxpayer dollars and how they absolutely, positively won't account for any of it -- where it went nor if it produced any jobs at all? Opps, sorry that's not really business news is it? Mon, Aug 8, 2011 : 8:50 p.m.
Mon, Aug 8, 2011 : 7:29 p.m. This isn't a news story, it's an advertisement. Tue, Aug 9, 2011 : 9:42 p.m.
...and what else is new at AA.com? Mon, Aug 8, 2011 : 6:57 p.m. I miss Tom Monaghan, he did so much for our community, the Tigers, Architecture, etc. - what a great person ! Mon, Aug 8, 2011 : 7:48 p.m.
Another religious nutcase who wanted to control our democracy with his millions. Now he's in FL trying to do the same thing and getting the same reaction he got here in MI. I still see him now and then in the Dominos Farms office complex. A very pleasant and unassuming fellow. Mon, Aug 8, 2011 : 7:27 p.m.
Mon, Aug 8, 2011 : 5:59 p.m.
Why do people only have negative things to say about a profitable company based in Ann Arbor? This is not only news, but good news. You'd all be complaining if Domino's tanked and everybody lost their jobs. Just can't win I guess. Mon, Aug 8, 2011 : 8:17 p.m.
Mon, Aug 8, 2011 : 6:59 p.m.
Mon, Aug 8, 2011 : 5:43 p.m.
And this sells pizza ? Mon, Aug 8, 2011 : 7:12 p.m.
Mon, Aug 8, 2011 : 5:17 p.m.
Why? Everyone's bad memories had just started to fade away. Mon, Aug 8, 2011 : 5:10 p.m.
Yeah, it's interesting to see throw-backs coming full circle. Mon, Aug 8, 2011 : 5:09 p.m. They definitely improved their product from the 80's tomato paste covered cardboard model. Mon, Aug 8, 2011 : 4:03 p.m. I believe that's &quot;long-eared&quot; not &quot;long-earned&quot;. Mon, Aug 8, 2011 : 7:58 p.m. There you go again - insisting on editing and proof reading. Please just accept the fact that there isn't any on AA.com (but lots of comment censorship) and forget about all the errors and omissions you see constantly. Mon, Aug 8, 2011 : 4:08 p.m. Yes, fixed the typo in the caption, thanks! Mon, Aug 8, 2011 : 4:02 p.m.
Mon, Aug 8, 2011 : 6:20 p.m.
Mon, Aug 8, 2011 : 5:01 p.m. It is a nice change of pace from the norm on this site - break-ins, robberies, etc. Oh, and stories about the police force being cut so we can all live in a paradise filled with art. It is better reading that the NOID is back stealing from people rather than hearing about the real thing.